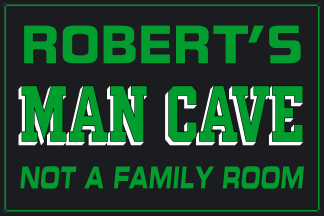 Our exclusive Man Cave, Not A Family Room themed man cave sign now comes personalized. A wonderful addition to one's man cave decor. This Personalized Man Cave Metal Sign - Man Cave, Not A Family Room comes personalized with your name up to 20 characters long. The personalized name comes in all uppercase letters.